Up today is a fun green from Diamine Ink. 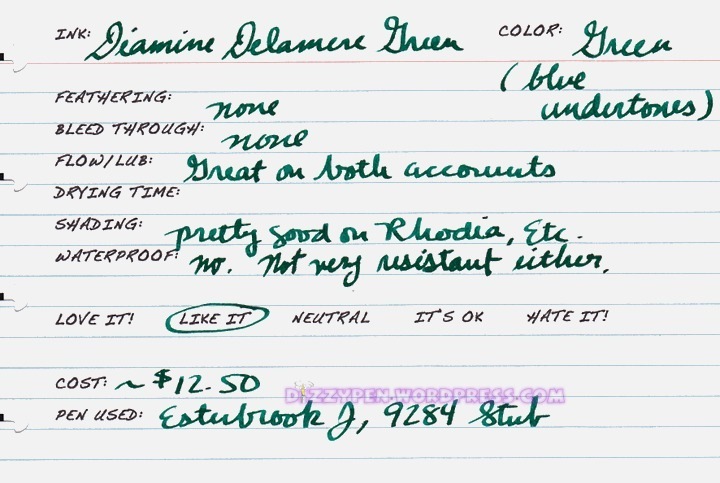 It is Diamine Delamere Green. I’m not big on green inks, but I quite like this one. I think it is because of its blue undertones (I’m a sucker for blue-green inks). Make no mistake, it is definitely more green than blue. My husband has to use a green ink for work, and this is one of his favorites to use. He usually uses a Lamy Safari with a fine nib or a Faber Castell Basic with a fine nib. He is a lefty over-writer, and he reports no issues with smearing. Drying time is average with a normal sized nib, but was a bit extended with the fat stub on this Estie. There was no point in even trying to get a calculation. The time was well in excess of 30 seconds. Shading is good especially with a fat juicy nib on a coated paper like Rhodia, et al. This ink was sent to me for review by the good folks at Diamine ink. I am not otherwise affiliated with them.